HHFD EMS transported the injured child to the hospital. Bergen County authorities at the scene. 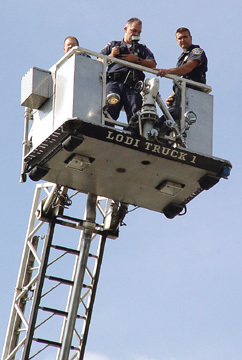 Lodi ladder truck assisted Bergen County Prosecutor's Office with aerial photos. 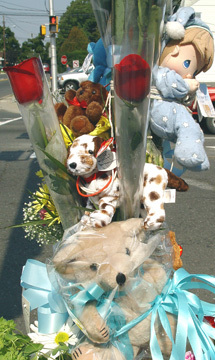 The Boulevard was closed until after 5:00 p.m.
On September 3, 2004 about 11:30 a.m., an adult and a young child had just left Dunkin' Donuts and were crossing with the light on the Boulevard heading east when a SUV traveling east on Williams, turned left onto The Boulevard and struck the pedestrians. Witnesses said that the adult was clipped by the vehicle, but the child was hit before the vehicle sped off. It appeared that the child traveled about 15 feet. HHFD fire department responded and transported the child to the hospital. 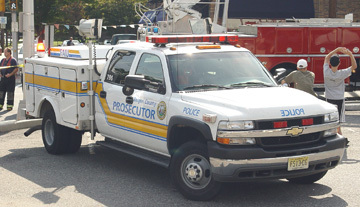 The Bergen County Fatal Accident Investigation Unit was reviewing the scene. 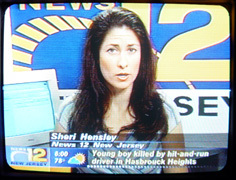 The child's status is unknown at this time. 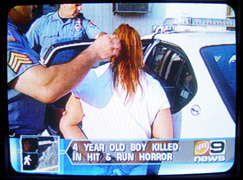 Four year old Eric Vicario of Elmwood Park was killed by a hit and run driver while crossing The Boulevard at Williams Avenue just before noon on September 3, 2004. Robert Pfister, 33, of Hasbrouck Heights and the child has just left Dunkin' Donuts when they were struck by a red Ford Expedition turning left onto The Boulevard from Williams. According to a witness, Mr. Pfister was closer to the intersection and Eric was walking on the inside. They were holding hands. Pfister was bumped and did not need medical attention. The child was struck in the head by the left side front bumper, and investigators are looking into whether he was also run over. 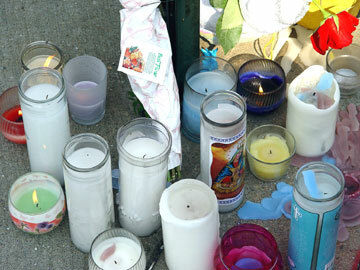 The boy was taken to the Hackensack Medical Center by the HHFD where he was pronounced dead. The police were on the scene almost immediately. A call went over a special emergency network with the license plate for a red Ford Expedition. Bergen County Sheriff's deputies stopped and arrested Gloria Amendano, 35, of Hackensack driving the SUV traveling east on Route 46 in Little Ferry. Amendano acknowledge that she struck Pfister but did not know she struck the boy. According to authorities, Amendano was charged with knowing leaving the scene of an accident resulting in death (an offense that carries a penalty of three to five years in prison), careless driving, failure to yield to a pedestrian and possession of a fictitious license. They are awaiting toxicology test on Amendano. 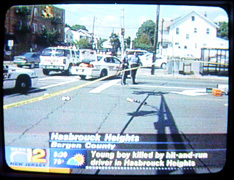 HASBROUCK HEIGHTS, N.J. (AP) Police arrested a driver who allegedly fled the scene of a hit-and-run accident that killed a 4-year-old boy Friday. 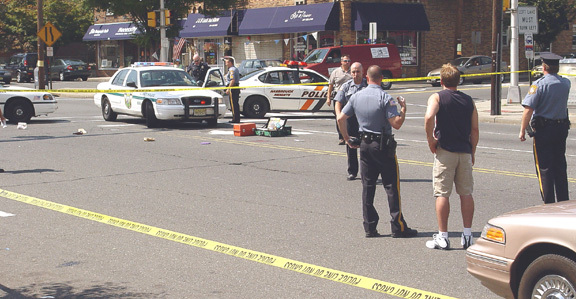 The boy, Eric Vicario of Elmwood Park, and Robert Pfister, 43, were walking hand-in-hand across a street when a sport utility vehicle driven by Gloria Amendano, 35, of Hackensack struck them around noon. It was not clear if Pfister and the boy were related. Pfister was only bumped by the car and apparently did not sustain any serious injuries, authorities said, but Vicario was run over by the vehicle. He was taken to Hackensack University Medical Center, where he died about 40 minutes later. 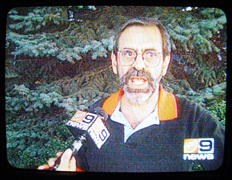 Amendano drove off after the accident and the vehicle was later stopped in Little Ferry, authorities said. She was arrested and charged with knowingly leaving the scene of a motor vehicle accident resulting in death, which is a third-degree crime, and leaving the scene of an accident.